Please send good thoughts and wishes to Renae De Liz, the creative force behind the Womanthology project, who’s in the critical care unit of her local hospital fighting off a nasty infection. Womanthology began as a Kickstarter project to showcase the work of female comic creators and has led to an ongoing series with IDW. DC Comics has also released solicits for its “Zero” issues in September that will outline the updated origins of its heroes, including Batwoman, Birds of Prey, and Batgirl. In issue #4 we saw the Phoenix about reach its destination. Now in issue #5, we get to see more of the fighting and more of what is going through Hope’s head. The arrival of the Phoenix could mean death or rebirth to those involved. Hope just wants to have the chance to prove she is capable to handle it and if she isn’t, Logan has promised to put her out of her misery. Unfortunately for Hope, as the Phoenix gets closer, she starts to feel its power and starts to realize just how little she can control it. The poor girl can’t decide if she’s the bomb or the bomber. Is she the one who will be responsible for the death of innocent lives or the rebirth of an entire race? After struggling to control a power Cyclops believed she was meant to have, Hope finally begs for mercy from Logan, who fights to her side to fulfill the promise he made. The battle turns as Iron Man accidentally cuts the Phoenix into five separate entities and each possess a different member of the X-Men team. This turn of the tides has me really excited. It will be interesting to see what happens now that the Phoenix has taken over not one, but five individuals. The artists are doing an amazing job capturing the action as well as the emotions of the characters. I’ve caught myself looking over the books a second and third time, not for the words, but the art. I’ve even caught a few things looking back over them, that I missed the first time around when I was caught up in the story. I’m still a little unsure how I would like to see this story end, but I’m hoping that none of my favorite characters meet their final pages. It would be nice for Hope to get a happy ending as well, but then again, depending on whose side your on, depends on what a happy ending is. I only have DC Comics titles on my monthly reading list, so I have been looking for a good standalone story to rekindle my interest in the Marvel universe. 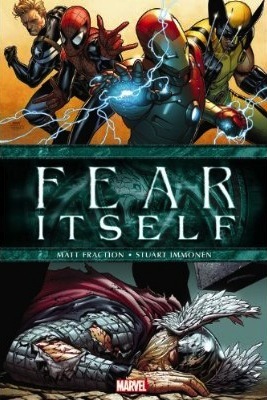 Fear Itself is the collection of the prologue and seven-issue mini-series by the same name. In this storyline, the Avengers (and eventually everyone else through crossovers) battle a seemingly unstoppable foe who is intent on destroying mankind. Once the action starts, Fear Itself is relentless. The scale of the worldwide war is conveyed well and a sense of foreboding is established early in the series. There are epic battles, character deaths, destruction, mayhem… so much that it teeters on the edge of overwhelming. If you are also looking for a recent “event” series, this isn’t a bad place to start, especially if you’re looking for an Avengers-focused story after seeing the film. I don’t feel like it pulled me in as much as I wanted it to, however, so I’m still on the lookout for a good story to get me back into Marvel. We’ve told you what we’re reading, now tell us what your reading. Is there anything you’re looking forward too or would like to see us cover? Tell us in the comments section. We enjoy hearing from you.